ANC Chief Whip Jackson Mthembu is wary of further twists and turns to the smear campaigns that erupted spectacularly over Deputy President Cyril Ramaphosa at the weekend. But with nominations for the ANC presidential contest now officially open, he didn’t mince his words. “I am part of the CR17 (Ramaphosa) campaign… Those who are sniffing, they do know that. There’s nothing to hide”. By MARIANNE MERTEN. His inclinations emerged on Monday in the wake of the Sunday Independent writing on the deputy president’s reported infidelities and alleged blesser tendencies. The timing of these claims was questioned by Ramaphosa in an official statement as “an escalation of a dirty war” resembling apartheid “stratkom” techniques and, with the exception of one affair years ago, denied by him and his wife Tshepo Motsepe in an interview with the Sunday Times. “I will continue to support @DPRamaphosa to be @MYANC President. 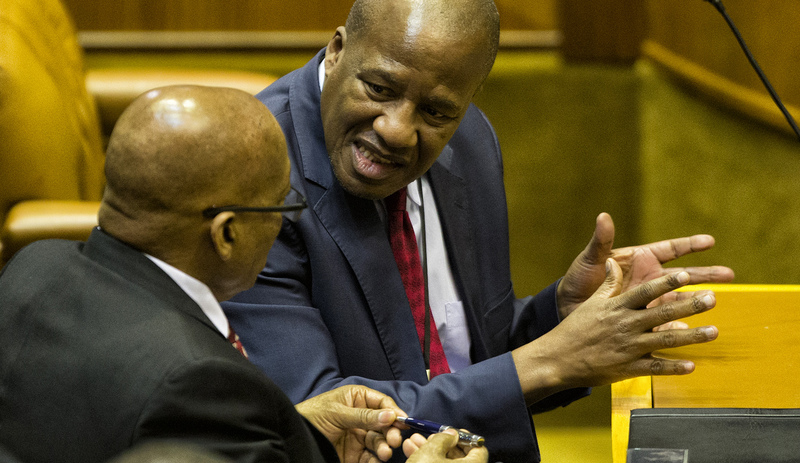 No amount of sleaze and dirt thrown at him…” Mthembu tweeted. On Tuesday it was put on public record that this support goes beyond a social media statement. “My preference is no secret. Those who want to keep their secrets, it’s their business. Indeed, I am part of the CR17 campaign,” said Mthembu. Critics of the ANC might be confounded by the governing party’s take on internal arrangements, but it’s really quite simple from an ANC perspective. In a no confidence motion against President Jacob Zuma, the party line on the rules of voting is firm because the governing ANC will not brook being told by others how to conduct its business. The same party rules allow public expression of preferences, from a determined point of time, with regards to declarations as to who should be the next party president and other top officials. And, like Mthembu, others in the ANC parliamentary caucus have their preferences, as do those on the ANC national executive committee (NEC). For the ANC there’s no contradiction, as there is no contradiction for the DA to censure its Western Cape Premier Helen Zille for the controversial tweets that there were worst things than colonialism, while retaining her in public office. Of course, it’s much more complicated given the sway of patronage and influence peddling in ANC ranks where policies such as cadre deployment in some circles hold the promise of access to the levers of power in the state – and tenders. And sometimes internal ANC processes are manipulated and used to close ranks as is the habit of the 105-year-old organisation, come hell or high water, as happened twice in the past 10 months when NEC discussion of Zuma stepping down was defeated by numbers. That numbers game held sway even amid the public outcry over a series of governance scandals and calls from veterans, civil society and ANC tripartite alliance partners, labour federation Cosatu and the South African Communist Party (SACP). But for those who are seeking a change, the official opening of nominations for ANC leadership is an opportunity to return the ANC to its long-held principles and integrity, away from corruption, patronage and state capture. There has been much talk of this not only by CR17, but also others like the campaign by Lindiwe Sisulu, ANC NEC member and Human Settlements Minister – a combination that polls are proving popular, according to a weekend Sunday Times report. For Mthembu, Ramaphosa is the politician to drive that revival, and his approach to the campaign trail – talking action against state capture and renewing ANC traditional values – has found resonance. It now must translate into support by ANC branches, which form 90% of voting delegates at the December national elective conference. The challenges, as problems are these days politely described, include not getting the right people for the job, be it in departments, Cabinet or Parliament, or when people are in jobs, their refusal to abide by the ANC’s various structures such as the integrity committee or disciplinary structures to step aside in the governing party’s interest in line with the 2012 Mangaung resolution that those accused of wrongdoing should step aside until allegations are resolved. None of this is new or unknown, having most recently been detailed in the diagnostics report ANC Secretary-General Gwede Mantashe submitted to the ANC national policy conference in June. That diagnostics report also lists “perceptions” of corruption attached to the ANC, and the influence of the Gupta family. Mthembu said he didn’t care who slept with whom, there needed to be the political will to change and show South Africans that change. “This renewal needs a leadership collective that will do everything in the interest of renewing the ANC… You therefore need political will and you need people who (have) already committed themselves to renew and turn,” said Mthembu, describing Ramaphosa as “a willing person… to change things, to change the trajectory. We need to change the trajectory”. If the ANC showed voters it could change its way for the better, its downward electoral showing since 2009 as outlined in various conference reports might be reversed, even as an Ipsos poll predicted 47% support for the ANC if an election were held tomorrow, according to the Sunday Times and City Press. And so in many ways the ANC party presidential race goes to the heart and soul of the governing party. Or to put it somewhat crudely: the kind of ANC espoused by Gauteng’s leadership which has, for example, put its tenders on a public website in the interest of transparency, or the more traditionalist-focused version which has emerged under the Zuma administration. Central to this is the availability of the right people for the job. “We must show we are changing this for the better. Do we get the right people at the strategic level?” said Mthembu. And that’s something that hits close as chief whip, who has to ensure that MPs with their own preferences in the factionalised lobbying at the national elective conference continue to work together. It’s not easy as the response to an official directive institutional directive to inquiry into State Capture claims. Issued in late June to four committees – transport, mineral resources, public enterprises and home affairs – to date only the public enterprises committee has moved towards an inquiry focused on Eskom. The home affairs committee accepted the briefing by the director-general and only after a follow-up meeting did the mineral resources committee announce it was ready to meet Mosebenzi Zwane, the minister who reports to it, with no date yet announced. Parliament is being taken for granted by some. There are issues of discipline from absence, failure to do parliamentary work, and shoddy standards. When ministers answer questions in the House it is an opportunity to address the nation and voters, but unfortunately there were some not doing this as expected by the ANC. But the ANC parliamentary caucus would continue to work as it must. And Mthembu is quite clear: He’s part of CR17 not for a job or more senior post, say for example in Cabinet. “No” was his categorical reply to a direct question. Being outspoken wasn’t about getting a position. There was a price to political activism, as there was in the days of the United Democratic Front. “I’ve not had time with my family. Some of my children have become what they have become because I have not been there… My first-born has been in prison and has been in and out of rehabilitation.” Mthembu said he can’t remember when last he was home with his wife.